LG earns a second spot on the list with the WM4270/DLEX4270 combo. Compared with the 8000, the 4270 is a bit smaller and a bit cheaper. That said, its capacity is still large enough to accommodate king size bedding. The alert chimes on both the washer and dryer are pleasantly musical, and the machines themselves are fairly quiet. 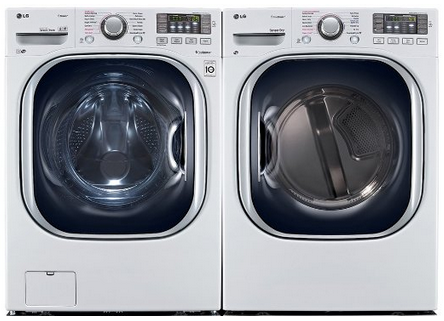 Like most other top-quality front-loaders, the higher spin settings will have your clothes coming out of the washer already mostly dry, making hanging your clothes to dry indoors a real possibility, if you’re into that sort of thing. Like the 8000, this washer has a door catch to prevent you from sealing it when not use and turning your wash tub into an unwanted science experiment. Despite being a little bit smaller than the 8000, the unit is very tall when stacked. So, as with the other models, some users may need a stepping stool to comfortably reach the dryer controls. There are some negatives. Users agree that the buttons are a little bit sensitive. And If you need to reverse the swing of the doors, you’ll find it’s not as easy with these machines as it is with some of the others. The lighted dial can actually be difficult to read if the room is too bright. (Go figure.) One customer complained that, due to a design quirk, excess foam in the washer tub will cause the parts to rust. So you might want makes sure you don’t add more detergent than necessary and keep an eye out.. Bear in mind that while that’s a pretty serious flaw no other users reported experiencing that particular issue. The minority of negative reviews reveal a pattern worth mentioning. More than a few users received defective washers, including washers that didn’t spin, some that wouldn’t stop spinning, and a few that leaked. Most who received defective units were eventually able to get them replaced with working machines. But not everybody has a high tolerance for navigating customer service. And you always run the risk of finding yourself in a situation where the retailer and the manufacturer can’t decide whose responsibility it is to fix the problem. That said, I don’t want to blow the issue out of proportion. The vast majority of customers appear to be very happy with their 4270s.